If you watch cable TV — especially basic cable during the daytime — you’ve likely seen your share of heartwarming ads showing off cancer survivors who were saved from the brink by the handsome physicians and nurses at [Fill In The Blank] cancer treatment center. Over the last decade, direct-to-consumer marketing by cancer centers has soared, with much of that spending concentrated in the hands of about two dozen operators. However, some doctors are concerned that these ads aren’t selling patients on the reality, but on the experiences of a few rare cases. The ad-spending figures come from an analysis published recently in JAMA Internal Medicine, which looked at spending by cancer centers on TV, print, and online (both banner and search) advertising between 2005 and 2014. 1. Experience: Center should be able to provide details about its proficiency treating your type of cancer & its success rates. 2. Treatment: “Advanced treatment options,” doesn’t mean much. Find out how your medical team plans to treat your cancer. More than one option might be available; what outcomes should you expect from each? What’s the treatment timeline? Are there clinical trials? 3. Risk: Different treatments have different risks & side effects. Doctors should be willing to explain them to you. 4. Cost: If you have insurance, your choices may be limited to those in your plan. If cost is a concern, ask if the center offers financial assistance. 5. Quality of life: What can be done to help you manage your symptoms? What kind of access will you have to your doctor? Are office hours convenient; can you reach them during off-hours? Where will your family stay? 6. Support services: Ask about dietitians, physical therapists, social workers, psychologists, & other professionals who can help you and your family members. This did not include ads seeking donations for cancer centers or advertising in niche-market publications for physicians; just ads intended to appeal to people who may be looking for a cancer treatment facility for themselves or someone else. According to the study (which adjusted all dollar amounts to 2014 dollars for sake of comparison), total ad spending by cancer centers was just over $54 million. In 2014, that number had more than tripled to $173.5 million. Online ad spending (for which the report only has data from 2010 to 2014) grew the most in a very short time — from around $300,000 total in 2010 to $8.63 million in 2014. However, that’s still only enough to account for around 5% of all ad spending. The biggest spender, by far, in 2014 was Cancer Treatment Centers of America. The Florida-based for-profit chain that currently operates facilities in five markets (Atlanta, Chicago, Philadelphia, Phoenix, Tulsa) spent nearly $102 million on advertising that year — accounting for around 58% of the entire industry. The ad features a few smart-looking (and likely quite smart) doctors talking about the treatment with words and phrases most people outside the world of oncology (or those who’ve had to deal with cancer treatment) don’t understand, but which sound fancy. Which is basically in line with the results of a 2014 study by the same researchers who published the data on advertising money. For that report, researchers looked at the content of more than 409 TV ads for 102 different cancer centers and found that they overwhelmingly market treatment (88% of ads) instead of preventative screening (18%). Compounding the issue, only 2% of the ads quantified the associated risks with the treatment being advertised, and only 5% gave an indication of cost. “Clinical advertisements by cancer centers frequently promote cancer therapy with emotional appeals that evoke hope and fear while rarely providing information about risks, benefits, costs, or insurance availability,” concluded that 2014 report. In fact, CTCA has been called out over its statistics in the past. In 1996, the company — along with two affiliated hospitals — settled a Federal Trade Commission complaint about its allegedly misleading marketing. According to the complaint, CTCA advertised that its survivorship rate for cancer patients was among the highest recorded, but did so without adequate evidence to back up that, and other, claims. While CTCA ceased making those claims, a 2014 Reuters investigation raised concerns about the statistics the company does provide on its website. At the time, the company claimed that 60% of is non-small-cell lung cancer patients were still alive six months after treatment (that figure now says 65% on the CTCA site), while the national average is only a 38% survival rate over the same timeframe. However, Reuters’ panel of nine experts on medical statistics unanimously concluded that — assuming the survival rate is accurate — this comparison is misleading, because CTCA patients are not statistically representative of the spectrum of cancer patients. The company treats — relative to other cancer centers — fewer elderly patients, and very few CTCA patients are covered by Medicaid (or not covered by any insurance). That eliminates two very large groups of people who may be more prone to problems with cancer treatment, either because of other age-related conditions or because they were reluctant/unable to seek out treatment early on. 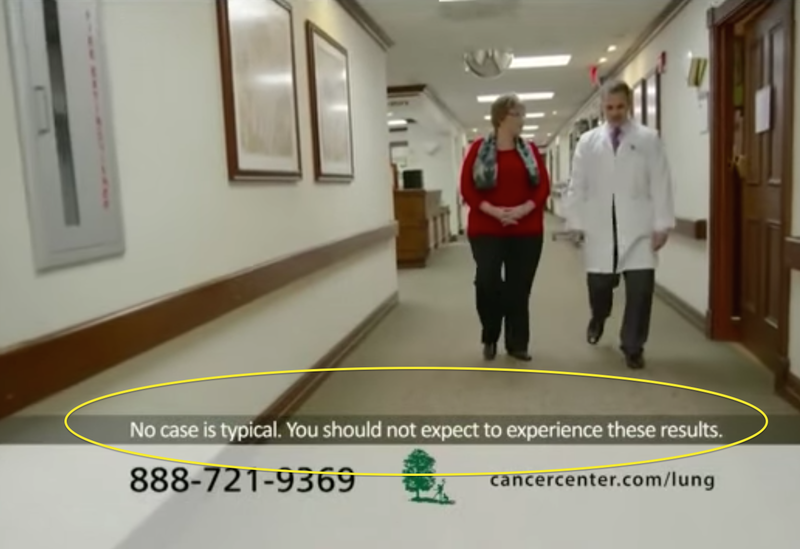 The CTCA ads — and the many, many stories and videos on the company website — do include the disclaimer that results are not typical (see screengrab at left), but that isn’t necessarily the magic shield against liability in a false advertising complaint. As physicians Lisa M. Schwartz and Steven Woloshin note in an editorial accompanying the new study, the FTC now places a higher threshold for companies wishing to use the “results not typical” disclaimer. Better yet, the FTC would have the company show testimonials from women whose results are in line with that typical result.